When it comes to home lighting schemes that improve the quality and enjoyability of your house, it’s essential to plan ahead and incorporate the perfect balance of lighting elements to illuminate your home with pride. Homeowners who excitedly rush into their projects often end up creating home illuminations that are too bright, too complex, or too costly. The Lighting Corner is proud to be your source for quality indoor lighting in the Jenison area, providing expert advice and affordable products since 1984. Our two expansive lighting showrooms in Grandville and Grand Haven feature the best designer lighting options available today, providing you with a wide range of choices to match your unique style. Today, we’ll continue our look into different types of lighting that are all valuable in creating a layered scheme that is sure to optimize the illumination of your home. When done, be sure to stop by one of our two amazing lighting showrooms for advice on how to create your ideal outcome! Ambient lighting is ideal for illuminating the entire room uniformly for general safety reasons. Beyond this approach, homeowners can benefit from introducing task lighting and accent lighting to create a more dynamic, versatile lighting scheme that is sure to make life easier. As the name entails, this type of lighting is useful for helping inhabitants perform certain tasks in the room. Task lighting can be helpful for many activities, including reading, doing homework, preparing food, applying makeup, paying the bills, and much more. The effectiveness of your task lighting will depend on its location and brightness. There is a plethora of fixed and hanging light fixtures available for this layer of lighting, ranging from track lighting in the kitchen for cooking a delicious meal to desk lamps for completing an assignment. While task lighting is more difficult to cover, the versatility of lighting fixtures available make shopping for this element both fun and rewarding. Be sure to balance your task lighting carefully, as too much illumination can create unproductive glares while too little light can result in eye fatigue. Also known as highlighting, this lighting type is very useful for creating drama and contrast in a given room. Accent lighting is typically used to highlight a certain aspect of your room, whether it is a vibrant houseplant, an engrossing piece of art, the new finish on that beautiful fireplace, and so on. It’s also important to note that accent lighting is perfectly suited for outdoor lighting applications as well, creating highlights for trees, gardens, walkways, exterior design elements, and more. One important consideration that many homeowners fail to realize until they flip on the new lights is the increased brightness needed for accenting an area in the room. Generally, three times the lighting is needed to create a focus on the area being highlighted. Properly balancing and layering the lighting in your home can create a stunning display that is sure to make your life easier. Determining how you are going to use the space is an important first step in creating a comprehensive lighting plan. 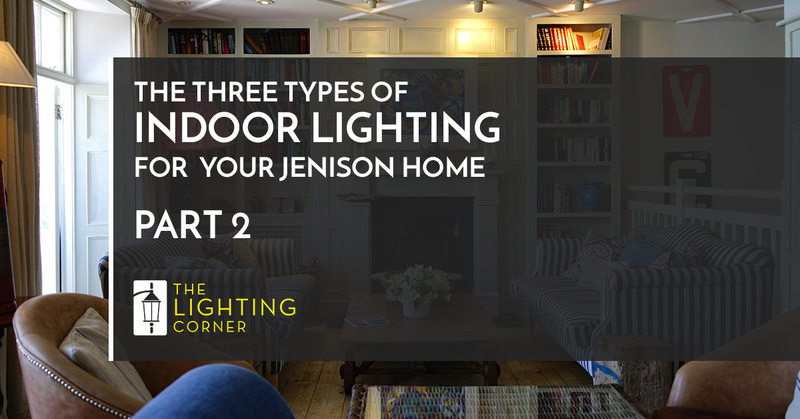 Those seeking indoor lighting in the Jenison area can benefit from working with pros at The Lighting Corner. Our two lighting showrooms and knowledgeable staff are here and ready to offer quality solutions for your unique project. Contact us today with questions or browse our online catalog to find inspiration for your project!